This sector is to some extent in the hands of Janet Yellen and The Federal Reserve. If the economy takes a turn for the worse and she behaves as dovishly as she is portrayed then we could see an increase in QE. However, if the employment figures continue to show slow but steady progress, then there will be no increase in QE and then the outlook for these metals will look less attractive. Should tapering be introduced the US dollar will appreciate and gold, having an inverse relationship with the dollar will suffer. The Fed appears to be satisfied that the economy is making steady, if slow progress and is on the road to recovery, hence the introduction of tapering. This programme of reducing QE possibly to zero looks set to continue and be completed towards the end of this year, barring any sudden reversal in the employment/inflation data for the US. The perma-bulls among us are confident that the lows formed in June 2013 for gold prices represent the bottom for gold and their enthusiasm for higher prices is indeed infectious. However, we view this stance with some trepidation as we are still of the opinion that this gold bull market remains in a bear phase for now. The bears won’t always have the upper hand, but until this bear phase exhausts itself completely there is little chance of a sustainable rally in this tiny sector. To maximise our profits we need to time our entry and exit points to the best of our ability. We all know that finding the exact bottom or top of a market is almost impossible to do, but this does not preclude us from trying to get as close as possible to these major directional changes, in this case from the bear phase to the resumption of the bull market. 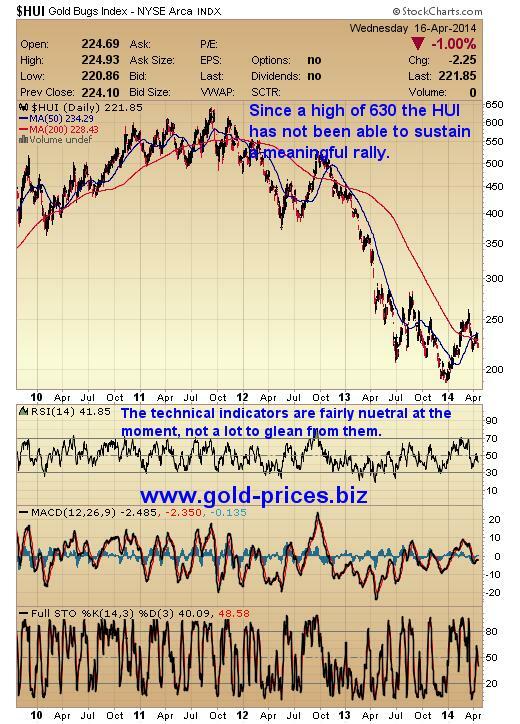 As we write Gold is trading around $120/oz above the June lows, silver is about $1.50/oz above its low point and the mining sector as evidenced by the Gold Bugs Index, the HUI, is sitting about 20 points higher. This is not the picture of a runaway success story, on the contrary it depicts a sector struggling to gain any traction and lacking in conviction. Retail investors and fund managers a-like need to have a clear view of the big picture before committing hard earned cash to any investment opportunity, failure to do so will render success as elusive as the Scarlet Pimpernel. The sparkling days when gold hit $1900/oz are now a distant memory as gold has fallen back, rallied and fallen back again. A number of head fakes and false dawns have placed gold prices in the precarious position of approaching the summer doldrums in a state of weakness. Gold is unloved and to some extent forgotten as its current bear phase has dominated for close on 3 years now, driving the weaker hands out of the market and putting a dent in the portfolios of those brave enough to stick it out. Silver prices have enjoyed a brief flirtation with the $22.00/oz level but failed to hold onto those gains. It is now trading at $19.58/oz which puts it back to where it was in December 2013, in a sideways trading channel. The performance of the precious metals mining sector is predicated on the performance of the underlying asset, along with the ability to produce the metal at a price lower than the selling price. Mining costs have accelerated over recent years with some costs now standing at $1200/oz, which has to be achieved before we can talk about profits. However, when these costs have been covered every dollar earned above these levels goes straight to the bottom line. This then becomes an exciting time to be invested in the mining sector as stocks can rise, in percentage terms, 2 and 3 times more than the metal itself. Taking a quick look at a chart of the HUI we can see just what a difficult time the miners are experiencing. A re-test of the June lows looks to be on the cards and should that support level fail to hold then we could see a re-test of the old ‘150’ level which was formed in 2008. A certain amount of euphoria was generated in the first quarter of 2014 when the miners came out all guns blazing. This rally was short lived and as of today the overall gain for this year is about 10%. When we take into consideration that these stocks had their values halved in 2013, then we can see that this move upwards is hardly a cause for celebration. Mints around the world occasionally run out of coins and bars and are unable to meet demand. China and India remain huge purchasers of physical gold. Iraq bought 36 metric tons of gold last month valued at about $1.56 billion, one of the largest purchases by a country in the last three years. The printing and debasement of paper currencies by a number of nations continues unabated. The supply of gold to the market is said to be dwindling. The situation in the Ukraine would appear to be getting worse despite the efforts of our political leaders and their negotiators, increasing geo-political tensions and fear. As logical and sensible as these arguments are the fact remains that gold and silver are not heading to the moon just yet. There could be one or a combination of reasons for this lack of progress, but the two that get our attention are the lack of a final capitulation in gold and silver prices and the reduction of QE via the Fed’s tapering programme. Gold’s progress was characterized by a sudden steepening of the curve leading to a final blow off when the price had gotten ahead of itself. We now need to see a similar occurrence take place during a sell off. However, this sell off, as torrid as it has been lacks that final spike down which occurs when even the most ardent bulls have had a guts full and finally throw the towel in. Gold and silver’s inability to sustain a decent rally suggests that it could re-visit and test its old June lows. Should this support fail to hold we could then experience a rather disorderly sell off taking gold back to the $1000/oz level. The ‘sell in May and go away’ strategy may be adopted in the coming weeks which may add additional selling pressure to the mining stocks. Also take note of the Federal Reserve Meeting planned for April 29/30th for any changes to monetary policy regarding tapering/QE/Rate changes, etc. Finally we need to see more in the way of all around strength in this sector before we can implement an aggressive acquisitions strategy, and so we have the lion's share of our portfolio in cash. Got a comment, fire it in, the more opinions that we have, the more we share, the more enlightened we become and hopefully our ‘well informed’ trades will generate some decent profits. From the small team here we wish you and yours a very Happy Easter.